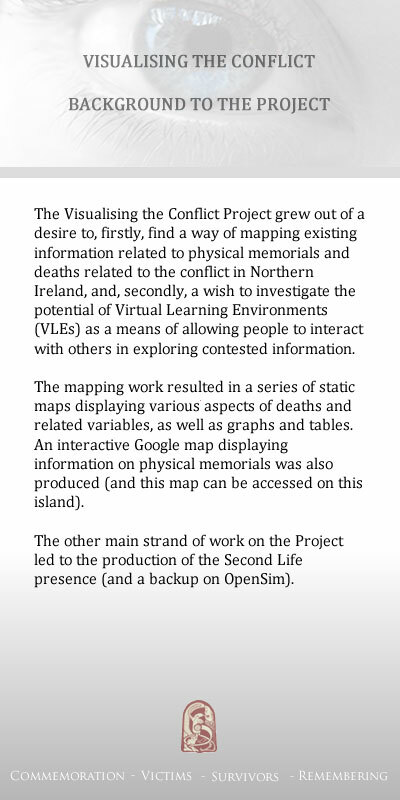 A significant element of the work outlined in the AHRC proposal on 'Visualising the Conflict', was to create a 'virtual educational space' which would allow users to interact with the information on physical memorials and at the same time to engage, and have an immersive experience with other users. It was decided to develop the virtual educational space and associated facilities within Second Life and to use OpenSim both as a backup to Second Life and as an alternative venue for viewing and interacting with the materials. Scenes within the virtual educational space (click for larger images). This Web page provides background information on how the work was undertaken and describes the resources that users will encounter if they visit the Second Life island. More detailed information can be found in the set of guides that are listed at the end of this page. The development work for the Second Life presence was undertaken by Julio Lopez Losada, CAIN/VTC Research Associate (Virtual World Programmer), and Kerri McCusker, CAIN/VTC Research Associate (Virtual World Modeller). They were guided in this work by Michael Callaghan, Senior Lecturer, and Shane Wilson, Lecturer, both in the School of Computing and Intelligent Systems, and supported by Martin Melaugh, CAIN Director. In the process of developing the virtual educational space a number of hurdles had to be overcome, such as moving 3D models and scripts from Second Life to OpenSim, and some new solutions had to be found, such as displaying a Google Map with overlaid data in Second Life and linking 3D models to a Google Map. The lessons learnt have been documented in a number of guides which are listed below. 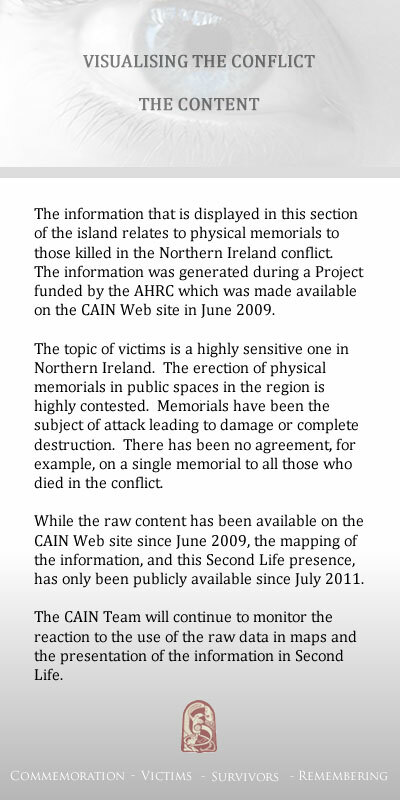 The underlying information related to deaths and memorials is available on the CAIN Web site. It is presented there in more 'traditional' formats: text, still images, tables, etc., that appear on static Web pages. Most users who consult the information do so on their own and so have a static single-user experience. However, the researchers were well aware that an important and growing segment of society, namely young people, are increasingly using Web 2.0 and virtual worlds' technologies to access information. Part of the Visualising the Conflict project sought to respond to these developments by presenting the information in more accessible and flexible ways. Hence the decision to incorporate the information into a virtual educational space. One potential advantage of this approach is that users can have interactive, dynamic and immersive experiences of the underlying information. They have more opportunities to engage with the resources using a collaborative approach. There are increased options for discussion, dialogue and group interaction. Following the official launch (20 January 2012) of the virtual educational space, the researchers will monitor the use made of the space and collate the feedback. The above SLurl will take a user's avatar to the centre of the Ulster INCORE island. 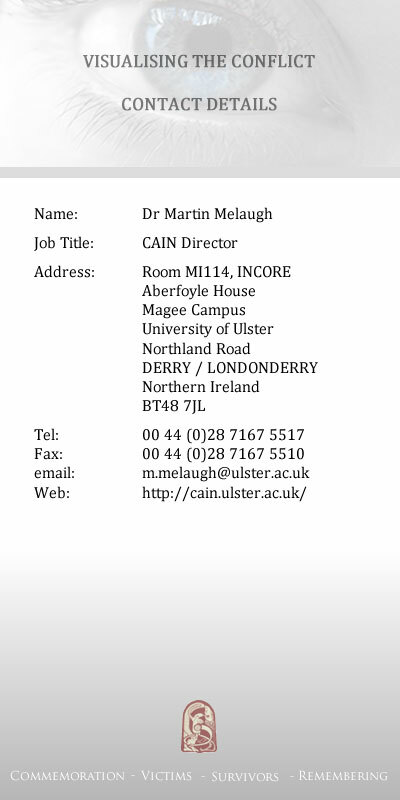 This is one of a number of islands that are associated with the University of Ulster. Anyone who has the Second Life viewer installed on their computer, and has a pre-existing avatar, can follow the above link and visit the Visualising the Conflict virtual educational space. Anyone who is not currently a user of Second Life can download the program/viewer and sign-up for an account and avatar. For those who do not wish to join Second Life, the following information is intended to give an indication of the layout of the island and the facilities and information that is contained on the island. Note: The guide does not include instructions for users who have no experience of the Second Life virtual world. It has been assumed that anyone planning to visit the Visualising the Conflict virtual educational space is either already an experienced user of Second Life, or will be able to download the necessary software (secondlife.com), set up their avatar, and learn the basics for moving around in Second Life. However, given that some of the information is presented on 'panels' it would be worth describing an alternative means of viewing this information rather than positioning an avatar directly in front of each one. Users can view the information panels without having to move their avatars by, for example, holding down the 'Alt' key (which changes the cursor pointer to a magnifying icon with a '+' symbol in the middle), then holding down the left-hand button on the mouse, and then moving the mouse forward, back, and side to side, to get a closer square-on view. Approximately one half of the island is currently developed; the remainder is reserved for future development. The developed part of the island is split into two major sections: the INCORE space and the Visualising the Conflict space. This page describes the Visualising the Conflict section of the island. A general view of the Visualising the Conflict virtual educational space. Teaching Area (a space for formal or informal meetings). 'Memorial Street' (which displays a small number of 3D models of physical memorials). Users can get an overview of the whole island or the Visualising the Conflict section by taking a guided tour (described below). New users are also advised to read the panels in the General Information Area before using the Map / Memorials Area. There is also a video which gives an overview of the main features of the Visualising the Conflict section of the island. This is available as a streamed file, or as a QucikTime movie which can be downloaded. At the centre of the island is the 'Teleport' arrival spot. Any avatar which teleports to this spot will land next to a 3D model/map which represents the facilities on the island. A view of the 3D model/map at the arrival point. 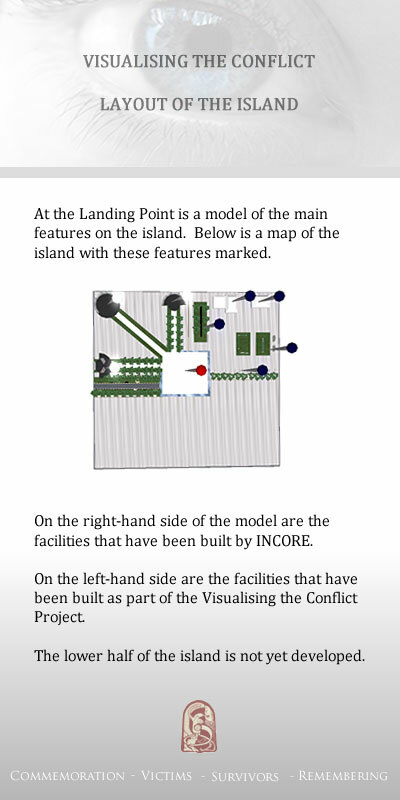 At the centre of the 3D model/map there is a signpost pointing the way to the INCORE and the Visualising the Conflict sections of the island. Also in the centre is a red 'pin' which avatars can 'touch' to obtain some basic information on the layout of the island. In addition the model/map has four interactive white 'pins' which allow avatars to quickly move around the island. 'Touching' a white 'pin' will teleport an avatar to the corresponding area marked on the model/map. On arrival the avatar will find another white 'pin' which can be used to teleport back to the model/map. Alternatively users can 'walk' or 'fly' their avatars to the main areas on the island following the paths that lead from the 3D model/map. On the ground at two of the corners of the model/map are two black 'hemispheres'. Avatars can 'touch' the hemispheres to obtain guided tours of the Visualising the Conflict space and the INCORE space. The General Information Area is the first of the three main areas in the Visualising the Conflict section of the island. 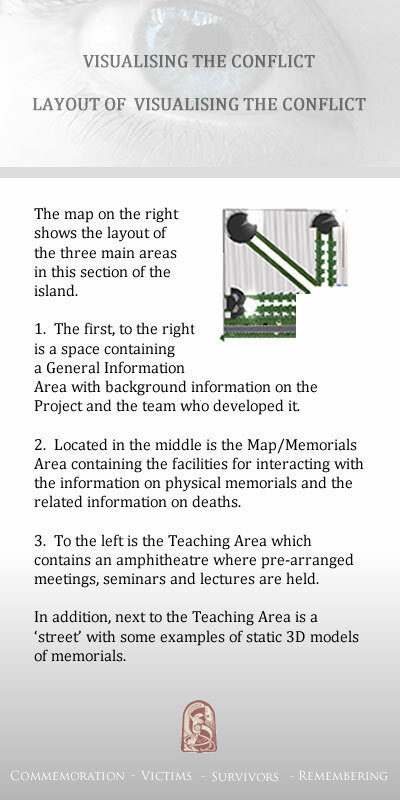 As its names suggests it contains information about the project, the layout of the island, and how avatars can search for information in the Map / Memorials Area. Users who are new to the island should visit this area before using the embedded Google map to locate information on physical memorials. A view of the General Information Area. The landing point for the General Information Area is directly in front of the main information panel. At the landing point is a white 'pin' which will teleport the avatar back to the 3D model/map in the centre of the island. 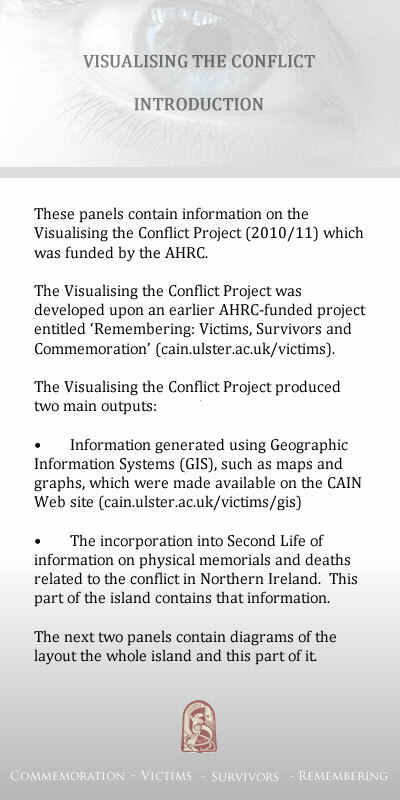 The large central information panel provides brief information on the groups which worked on the Visualising the Conflict project. There are five information panels to the left of the central panel which provide general background information. The second set of five panels, to the right of the central panel, provide more specific information. You can click on the 'thumbnail' images below to read the text on these panels. Click on 'thumbnails' to view larger images. This is the area where the bulk of the information on physical memorials, and related deaths, is presented. 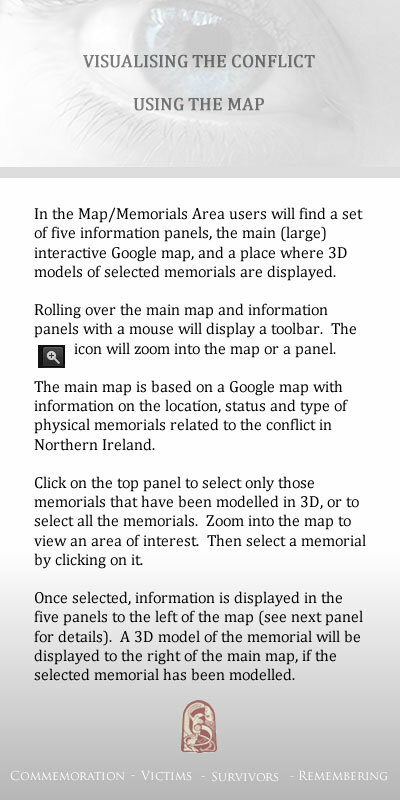 Users will find an embedded interactive Google map displaying overlaid information on physical memorials to the conflict in Northern Ireland. A view of the Map / Memorials Area. There is a 'ramp' in front of the Google map with a set of 'footprints' which indicate the best position from which to view the interactive map and the five interactive information panels to the left of the map. To the right-hand side of the map is an area where 3D models of physical memorials will appear, once a users selects a memorial from the map. Rolling over the main Google map and/ or the five information panels will display a toolbar above the map or panel (see example below). On the panel is magnifying glass icon which the user can click on to zoom into the map or panel without having to move the avatar. To zoom out again users can click on the magnifying glass a second time, or hit the 'Esc' button on their keyboard. The main map is an embedded interactive Google map which displays information on the location, status and type of physical memorials related to the conflict in Northern Ireland. 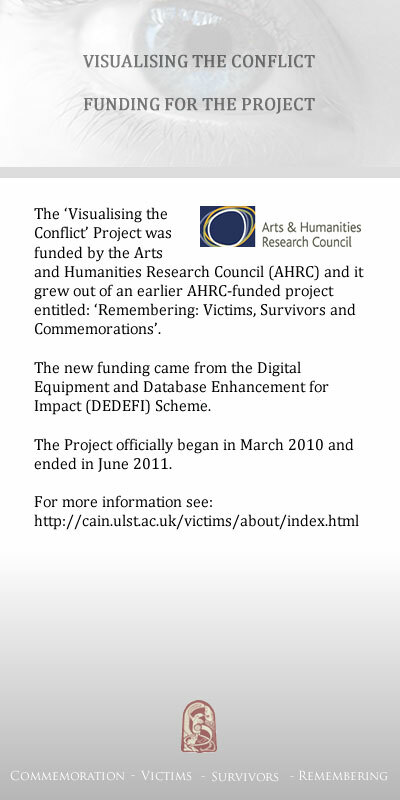 The CAIN database contains information on 640 physical memorials and of these 201 have been modelled for the virtual educational space. At the top of the Google map is a panel which users can click to alternate between viewing only the 201 memorials that have been modelled, or all 640 memorials. Next users should zoom into an area of the map that is of interest to them. It is possible to use the mouse to 'grab' the map and move it left or right, and up or down. When rolling over the memorial icons on the map, a pop-up window is displayed which (in the case of a single memorial at a specific location) displays the name of the memorial, the address of the memorial, and a thumbnail photograph of the memorial (see example on right). Users can then select a particular memorial by clicking on its icon. Once an icon has been selected a 3D model (if available) is displayed to the right of the map. 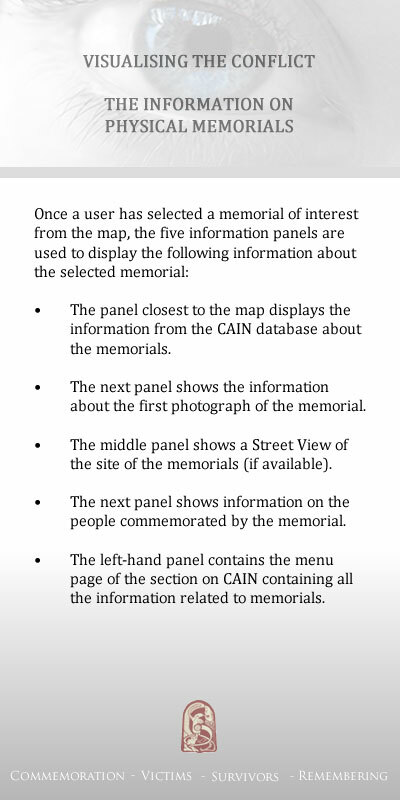 In addition information on the selected memorial is obtained from the database on the CAIN Web site and displayed on the panels to the left of the map. The Web pages displayed on these panels are 'locked' and will only display Web pages from the CAIN site. The third main area provided is the Teaching Area where informal or formal meetings can be held. A view of the Teaching Area. 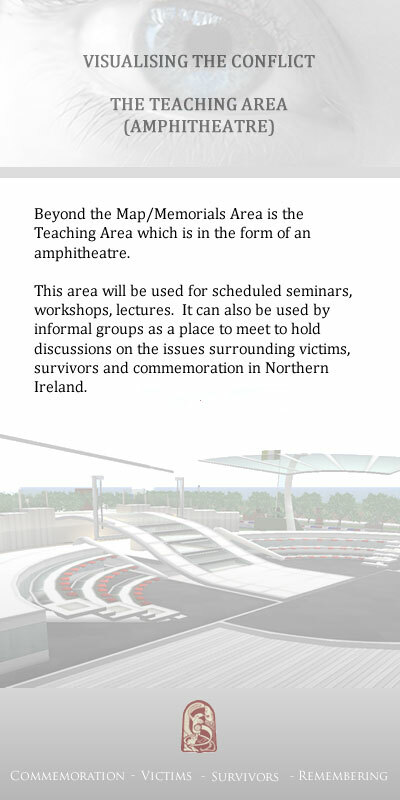 In addition to the three main areas described above, it was decided to include a 'Memorial Street' which could be used to display, in a static format, a selection of the 3D models of physical memorials. A view of 'Memorial Street'. In the Map / Memorials Area the 3D models are displayed one at a time at the choice of the avatar using the Google map. However, it was felt that some users might be interested in seeing a number of memorials set out side by side. While there are areas of Northern Ireland with a high concentration of memorials, and places with several memorials in the same location, the display is obviously unrealistic in that memorials from the two communities do not sit alongside each other as depicted on 'Memorial Street'. However, for people who have never visited Northern Ireland, and/or are new to the topic of memorials, this display of 3D memorials may give them an insight that is otherwise difficult to achieve. The following are a set of guides that have been written and compiled by Kerri McCusker and Julio Lopez Losada who undertook the development of the virtual educational space in Second Life and its back-up on OpenSim. Some of the work carried out involved finding solutions to problems that had not been encountered before. In order to pass on the lessons that might help others trying to achieve similar functionality a number of guides have been written and are available below as PDF documents. While the above Web page provides a basic introduction to the virtual educational space within Second Life, a more detailed description of the island can be found in the following guide. Before work could begin on the content, the island had to be purchased and developed. This process is described in the following two guides.